Team Sky’s Bradley Wiggins is the first British Tour de France winner. The 32-year-old triple Olympic champion made it safely through the final 120-kilometre 20th stage from Rambouillet to Paris – indeed he did much more than that, being a key part of the lead-out which delivered team-mate Mark Cavendish to his fourth successive sprint victory on the Champs-Elysees. It was Wiggins’ 13th day in the yellow jersey after he took the lead on stage seven and he finished the race with an advantage of three minutes 21 seconds over Chris Froome as Team Sky claimed a famous 1-2. Vincenzo Nibali (Liquigas-Cannondale) was third at +6:19. “I’ve had 24 hours for this to soak in and today we were just on a mission to finish the job off with Cav. So job done and what a way for him to finish it off. I’m still buzzing. “I’ve got to get used to going into the history books now, but I’m just trying to take everything in today first. It’s very surreal at the moment because this type of things [usually] happens to other people. You never imagine it happening to yourself. “It’s incredible what we’ve achieved today – what a team. We got a one and two on GC but still we were riding to control things on the Champs-Elysees. 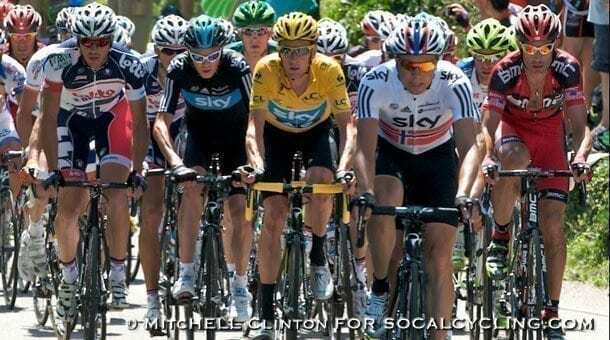 It was an honour to have the yellow jersey leading me out. Bradley told me he’d go full gas to the last kilometre and then Edvald (Boasson Hagen) led me into the last corner. The finish couldn’t have been more perfect – no better end to this Tour. Tejay van Garderen of the BMC Racing Team became only the third American to win the best young rider classification at the Tour de France Sunday while teammate George Hincapie made history by reaching Paris and finishing a record 16th edition of the world’s greatest bicycle race. Bradley Wiggins (Sky ProCycling) became the first rider from Great Britain to win the Tour de France while his teammate and world road champion Mark Cavendish won his third stage. Wiggins finished 11:04 ahead of van Garderen and 15:49 in front of Evans. Urged on by Wiggins and his team, Hincapie led the peloton onto the Avenue des Champs-Élysées near the end of the 120 km race. “I’m actually really good friends with a lot of the Sky guys and I would have liked to have been a little bit more low key about it,” Hincapie said. “But they were asking me to do it. So I went ahead and did it and it was a real honor for me to lead them into Paris.” In what is likely his final Tour after announcing he will retire next month, Hincapie finished 38th overall in his 17th appearance. Hincapie did not finish his first Tour in 1996 but he did reach Paris in each of his next 16 consecutive starts, a record.